Montreal grew rapidly during the first half of the 20th century and keeping pace was the construction of neighbourhood schools, often designed by well-known architects of the time. 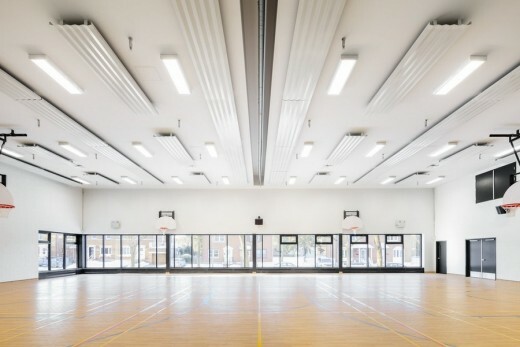 A decade ago, a major revamping program was launched by the Montreal School Board (CSDM) to deal with the serious need of upgrading their building stock. One of the first schools targeted for upgrade and expansion was Barclay School, designed in 1930 by Gordon and Thompson. 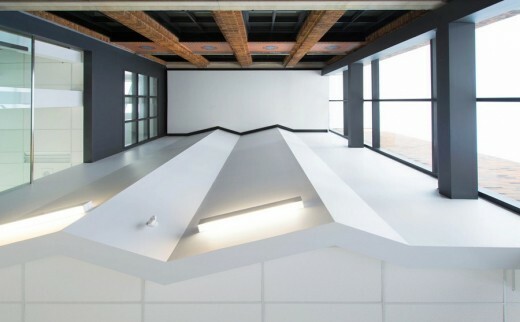 NFOE’s architects decided to pursue a design that would be both contemporary and respectful of the historical building. They were also faced with the local residents’ preoccupations about the potential loss of access to the vacant green space, just north of the existing school, which they had become accustomed to enjoying as “their park”. 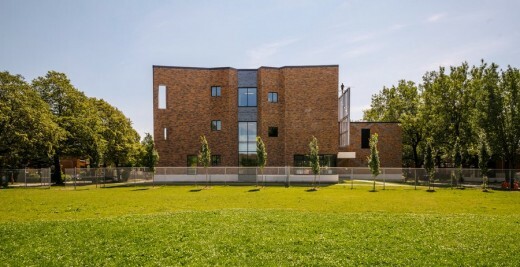 Through quality design, the architects wished to foster a strong sense of belonging amongst the mostly immigrant families of the neighbourhood. 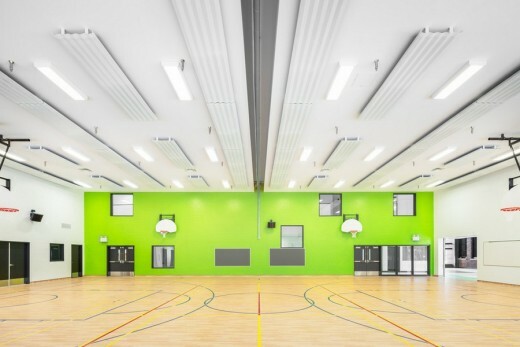 Barclay School was awarded one of Montreal’s most prestigious awards, the Grand Prix du Design, in 2014. Barclay School is an elementary school located in Park Extension, a neighborhood with a fast growing youth population. The school was in great need of additional classroom space, but it also lacked an adequate sports facility. The proposed project included fourteen (14) new classrooms, a computer and robotics room, daycare space, a multi-purpose area, administrative offices and a new double height gymnasium, to be made available to the area’s residents outside of school hours. Due to the nature of the grounds, the most logical location for the new construction was the site immediately north of the existing building. 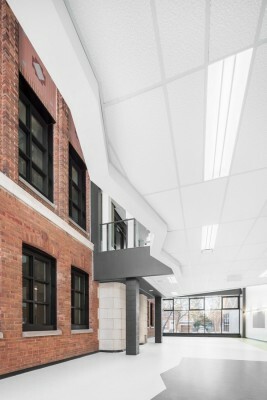 The 2853-m2 three-storey addition was built as a lateral extension to the older building, with floors carefully aligned for almost seamless circulation between the existing and the new. 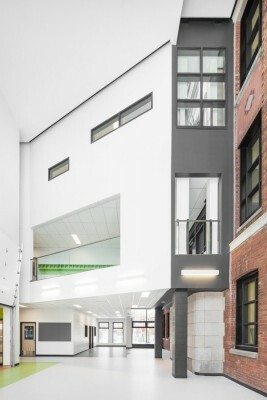 A full-height glazed atrium acts as a pivot and highlights one of the older brick facades. Open to above, it serves as a welcoming multi-use space on the ground floor. 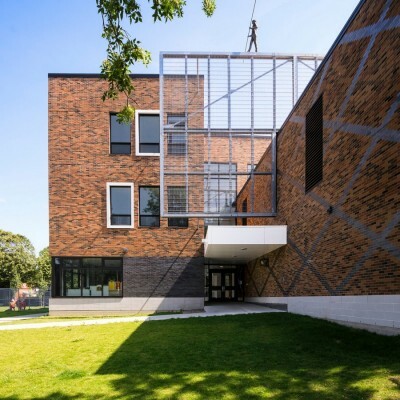 The brick chosen for the new wing recalls that of the historical building with its delightful latticework reproduced on the exterior walls of the gymnasium. The contemporary North façade appears to be partially folded, an allusion to “a butterfly unfolding its wings before flying away,” to quote the designer. 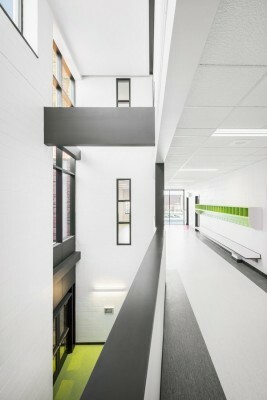 Windows were positioned in a random pattern, allowing the children to catch unusual glimpses of the world beyond. 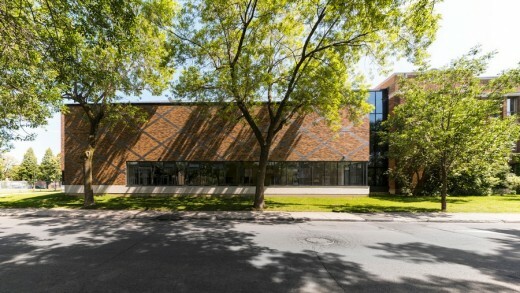 The volume of the new gymnasium (two-storeys high instead of three) was built at a slight angle, altering the rhythm of the West façade and sheltering the daycare service entrance. 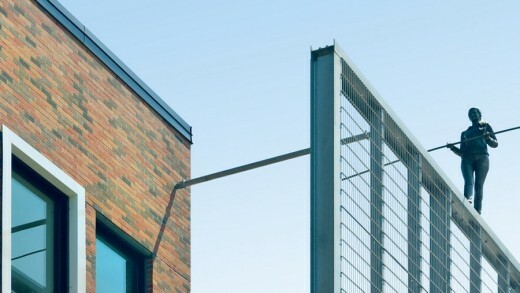 Straddling the entire length of the gymnasium, a fine wire mesh, designed as a “green” screen, is anchored to a solid metal frame aligned with the historic building. The screen, which delimits the area available for a range of rooftop activities, also acts as a brise-soleil protecting the roof from excessive heat. 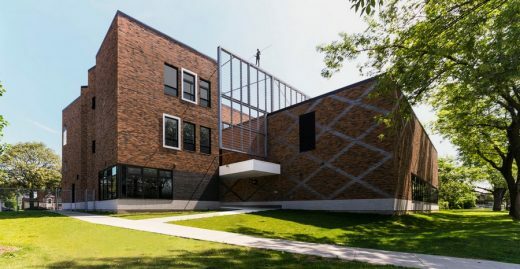 Perched on top of the structure, a sculpture of a young bronze tightrope walker watches over the schoolyard. 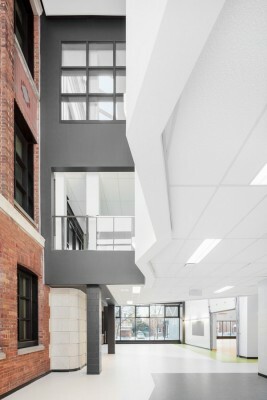 Communication between the new wing and the 1930 school is smooth as the architects ensured alignment of the floor levels. 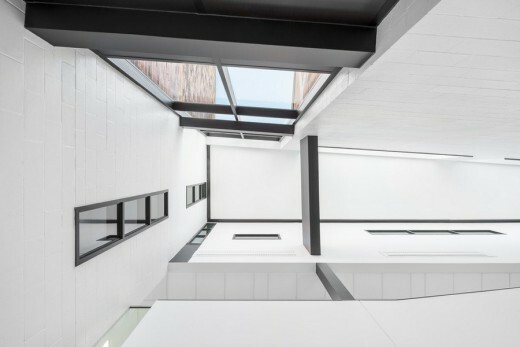 The ambiance is completely different however as one penetrates the atrium where natural light abounds and the eye catches subtle dashes of colour. 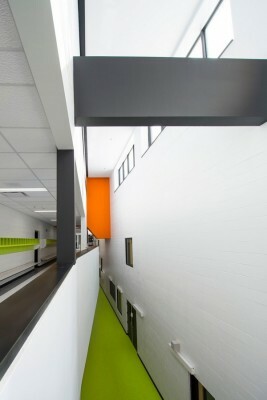 Corridors are open to each other from floor to floor and are a source of constant surprise for curious children. 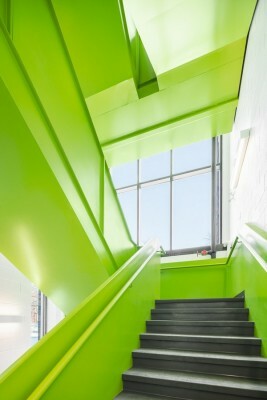 A tangy green colour defines one of the gymnasium’s walls and is echoed on the small storage boxes lining the corridors. It reappears on a playful emergency staircase in the back, which “might just as well have been a giant slide”, according to the designer. 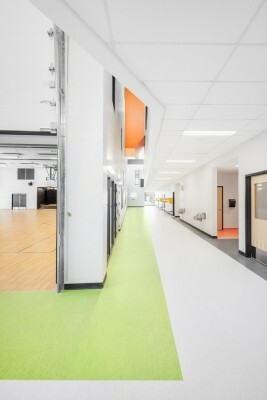 On the second and third levels, a bright orange volume signals the children toward the rooftop above the gymnasium. The project addressed a number of sustainable issues and targeted a 25% reduction in energy consumption using the NECB as a benchmark. 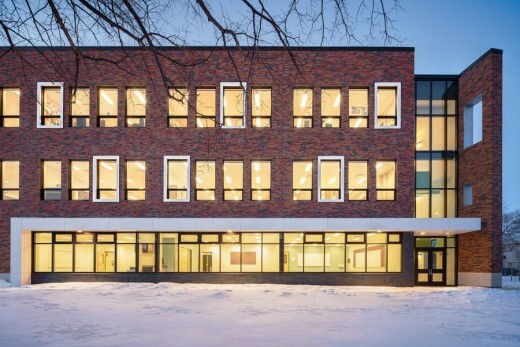 The building’s envelope was designed to improve the school’s energy performance, and a thermal wheel-based heat recovery system was installed. The new wing also features a reflective white roof and a vegetal screen. 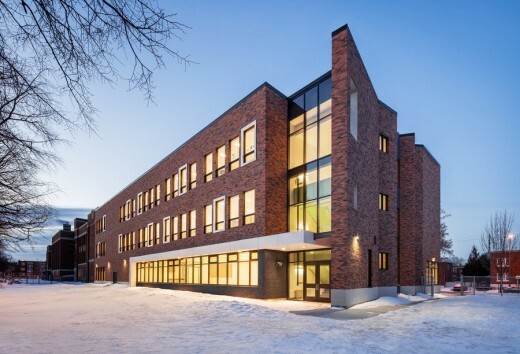 Founded in 1912 under the name of Barott, Blackader & Webster, the firm known since 2000 as NFOE et associés architectes has made a substantial contribution to the development of Montréal through the 20th Century. During recent decades, the firm has specialized in complex high-technology environments, building a solid reputation for itself thanks to its work on pharmaceutical installations, hospitals, public and private clinics as well as research laboratories. 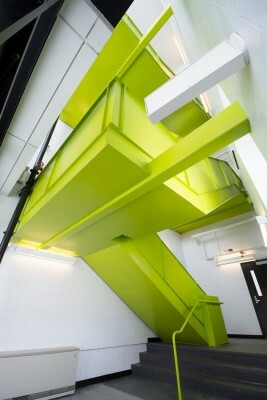 In recent years, NFOE has attracted attention for its elegant interventions and audacious use of colour. While quality services are the firm’s primary goal, emphasis is also put on the introduction of dynamic concepts, forms and colours. Over the past few years, NFOE has collaborated on several important projects for McGill University and the Université de Montréal, among them the new McGill University Health Centre (MUHC) and the Centre de recherche du Centre hospitalier universitaire de Montréal (CRCHUM). The firm was also involved on the design of the C-LAVIE Complex for Héma-Québec and is working on the future Science Complex of the Université de Montréal. 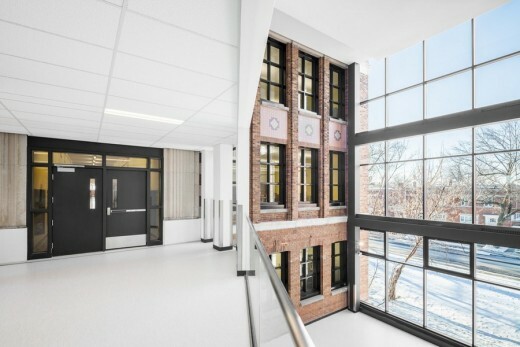 Apart from major pharmaceutical projects, such as the recently-announced Medicago Complex in Québec City, NFOE is currently designing clinics for the Jewish General Hospital, various data centers, and several schools for Montréal’s CSDM. 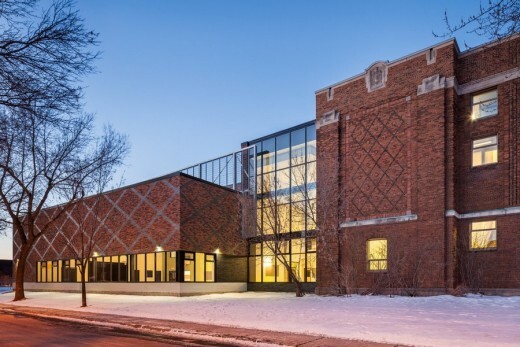 NFOE has won several design awards for its most recent projects, among them OVO, a fertility clinic in Montréal, NFOE’s own offices in one of Old Montréal’s most outstanding historical buildings, as well as the Dubrovsky Molecular Pathology Centre and Barclay School.